The VacuPowerlift from Fezer has for some time now been one of Granada’s most popular products and when you consider its benefits it is hardly surprising. If we told you that we could provide a material handling solution that is; safe and simple to use, would cause no damage to your product, is flexible, would not decrease but would in fact increase productivity and last but not least could be available at a very reasonable cost, you would surely ask “what’s the catch?” or “how is this possible?” and the answer would be – simplicity. Simplicity – because the only medium the VacuPowerlift needs for the gripping and lifting of the load is vacuum. 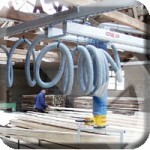 The use of lifting devices such as chain hoists becomes unnecessary and therefore keeps the cost as low as possible. The use of clamps, tongs or chains becomes unnecessary and because all that grips the load is vacuum formed from contact with a rubber suction foot and the load, no damage is caused. High safety standard in accordance with the strict European safety regulations CE, UVV, VBG 9a. This guarantees not only a steadily high quality standard, but also a high reliability and operational safety of the device. Because the VacuPowerlift is a closed system even in the case of power failure, sucked loads do not simply fall down: an integrated non-return valve makes sure that the sucked loads are dropped safely and remain under control until they are released from the suction foot. Control box with a tilting lever: Press the control lever up – the VacuPowerlift lifts the load. Press the control lever down – the VacuPowerlift lowers the load. Control box with a throttle: In this case you operate the VacuPowerlift like driving a motorbike: Turn forward – the load is lifted. Turn backward – the load is lowered. With such ease of use, within a short time of the operator using the VacuPowerlift, the customer will notice an increase in performance. By means of directly driven blower steps, the noise level is reduced to less than 75 dB(A). The blowers run with a low operating speed and have no drive elements that are sensitive to wear. Thus they assure a high reliability and durability. Consequently the operational safety is improved, the running costs are reduced and at the same time a perfect process of production is guaranteed. Flexibility – with the use of a ‘Quick-Change Coupling’ various suction feet can be rapidly exchanged without the use of any tools. 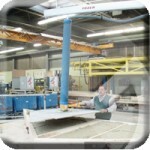 Complete Light Weight Crane Systems, Monorails and Jib Crane Systems.